CEO Marissa Mayer Treated Yahoo Like A Think Tank, Not A Sinking Ship : All Tech Considered The Internet pioneer Yahoo just had its core business auctioned off to Verizon. Mayer was hired four years ago to turn the company around. We look back at the critical early months of her tenure. 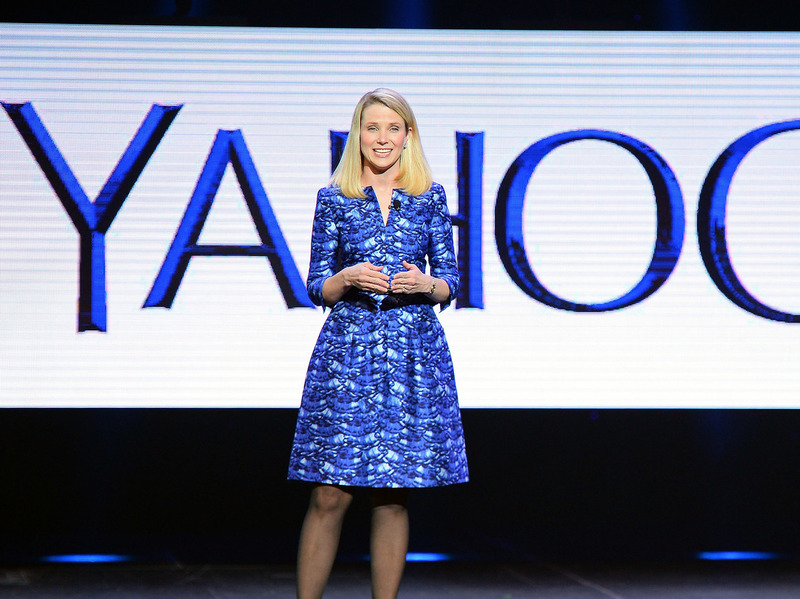 Yahoo President and CEO Marissa Mayer delivers a keynote address at the 2014 International CES in Las Vegas in 2014. Consider the context: Yahoo had just been through four CEOs in as many years. The board was impatient. And, as Mayer tells it, she spent her first six months "really listening" — much to the surprise of her staff. "When I first showed up at the company — my first day — everyone said, 'OK, so we're going to get you ready for your all-hands tomorrow. So you can come in and you can do the big dog and pony show, unveil your strategy.' "
"All hands" being the meeting where she'd address Yahoo's 14,000 employees. Mayer pushed back. "I said, 'you know, with all due respect, I'm not going to do a strategy presentation tomorrow. I have some broad brushstrokes of strategy around things like mobile being very important — but I really want to listen.' "
When Mayer joined Yahoo, posters of her adorned the walls — in the iconic hope style (a la President Obama). In the cafeteria, she remembers this one employee walked up to her, tray in hand, and said: "Is it go time? Is it time to go?" Her eyes shot open. So many people had quit or been fired by the time she got there. She told him, "Oh no! Please, please don't go. I've only been here for three days. Give me a chance! Like, we're going to try and work out something interesting here." The employee shook his head and told her, "No, no, no. You misunderstand." What he meant was: go get to work! He had ideas. He was tired of waiting for management to figure themselves out. This was music to Mayer's ears. To this day, she reads the resume of every person Yahoo considers hiring (that can be 50 a week) — and she has to OK each and every one. She says her job is to pick strong players, and then remove obstacles so they can do their thing. She told the cafeteria guy: "Look, I'm going to try and knock things down. But yes, by all means, go! Run! Do your ideas." And Mayer loved ideas. Collecting them, scrutinizing them. Years ago, San Francisco magazine reported that, to make cupcakes, she bought several cookbooks, put the ingredients in a spreadsheet, and tested recipes before ultimately writing her own. It sounds like she did a version of that with Yahoo, too: the CEO Challenge, her callout to employees to submit innovative ideas. She thought maybe she would get 40 ideas. She got 700. That is a whole lot of proposals to read — and quantity doesn't equal quality. Asked whether any one idea could turn into a billion-dollar business, she says, "No, but that wasn't really what the CEO challenge was about." Mayer didn't mention the winner: turns out it was a lawyer on Yahoo's patent team who proposed that Yahoo make money by selling patents — which is what it already does. And his prize: a Tesla (the luxury car). His co-workers were baffled: What exactly is Mayer rewarding? Some are fond of saying Yahoo's death (or auctioning off) was inevitable. It was not, according to former employees. "In 2012, I think things were much more salvageable," says Shashi Seth. He supervised several hundred people at Yahoo, reported directly to Mayer, and worked with her back at Google. It was a huge deal for struggling Yahoo to land Mayer, Google's 20th employee. By his and others' accounts, Seth was excited and optimistic. He was also aching to upgrade two products: mail and the home page. They made a lot of money, yet, in his opinion, "these were the two most ignored products across the company." While Seth left six months into Mayer's tenure, his take is consistent with people who stayed far longer. Yahoo Mail was so bad that, when you wanted to attach a file, it would ask a question that no modern user should have had to answer: Do you have a large file or a small file? "Nobody else asks you that question," Seth points out. He says Mayer didn't come in with a plan to make Yahoo Mail No. 1 (or anything No. 1, for that matter). Other senior employees say she didn't woo the big advertisers on Madison Avenue and convince them: "Hey, our data is awesome. We know who Yahoo users are, what they read. We can target ads better than Google or Facebook can." According to former employees, Mayer got caught up micromanaging small stuff like Yahoo's award-winning weather app. Still, Seth says, "Yahoo Weather was never going to save the company. Right? I don't care how great you made Yahoo Weather, it wasn't going to save the company." Seth has a theory: Yahoo could've made a comeback if Mayer focused on one or two communication tools, say email or a messaging app like WhatsApp (which, by the way, was created by Yahoo talent, just to end up acquired by Facebook). Instead, he says, the CEO threw time she didn't have into the part of the business that's fun, but will never turn a profit: media content. Media is glitzy and glamorous. Under Mayer, Yahoo announced the hiring of beloved TV host Katie Couric. Yahoo launched magazines. Yahoo landed an exclusive deal to stream clips of Saturday Night Live. "Thank you Marissa Mayer, CEO of Yoo-hoo, for having me," he said, in character. "Who would have thought that a small chocolate milk company like Yoo-hoo could turn into one of the world's biggest tech giants? It's amazing!" SNL was never going to save Yahoo either. In response to these criticisms, Mayer says she did update the home page, she built a mobile team Yahoo never had before, and users want good media content. It's unusual in Silicon Valley for people to criticize a leader publicly. Of the former employees NPR interviewed, Shashi Seth (who was not the most critical) was the only one who agreed to go on the record. Asked why, he talks about Yahoo nostalgically. "It's one of those companies that is iconic and defines Silicon Valley, defines the Internet," he says, "And it's a shame because a lot of people put a lot of blood, sweat and tears into it, and other than relationships with some great people, didn't get much for it." Mayer will get a lot for it. She has not said whether she is joining Verizon after the deal closes. I ask her if she'll get paid her severance either way. "I'll be honest, I've never really looked at it. So I'm happier to point to the actual filings," she says. The CEO who reads the resume of every hire, who read hundreds of CEO challenge proposals — she says she doesn't know. She's somehow missed that detail. The answer is: She does not have to join to get the money, $54.8 million.